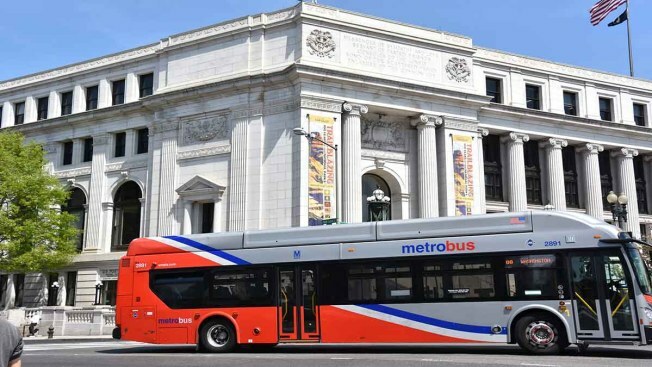 Metro said early Tuesday morning that more than 20 Metrobus trips were cancelled for Tuesday, Wednesday and Thursday due to "an equipment shortage." Some riders' morning commutes may be affected by the temporary cuts, which affect bus trips from as early as 5:45 a.m. and as late as 10 a.m.
All of the dozen affected routes are in, to or from Northern Virginia. The cancellations come almost two weeks after the transit agency temporarily pulled 164 buses from service due to two incidents in which engines cut off at low speeds. Metro deployed 80 reserve buses to make up for the loss, but the shortage continues to be an ongoing problem. "We are running 98% of all scheduled trips," Metro Chief Communications Officer Dan Stessel said in part. "The Bus Operations Control Center had some additional information this morning about individual trips that would be missed and generated some more-specific-than-usual customer alerts, but there is no was no significant impact to operations." 22A: Due to an equipment shortage, the 10:00am trip to Ballston will not operate April 10-12. 22C: Due to an equipment shortage, the 9:00 am trip to Pentagon will not operate April 10-12. 7M: Due to an equipment shortage, the 8:00am trip to Pentagon will not operate April 10-12. 16G: Due to an equipment shortage, trips operating btwn Pentagon City and Columbia Heights West will not operate April 10-12. 7M: Due to an equipment shortage, the 7:40am trip to Mark Center will not operate April 10-12. 18P: Due to an equipment shortage, the 6:59am trip to Pentagon will not operate April 10-12. 18J: Due to an equipment shortage, the 6:15am to Rolling Valley Mall will not operate April 10-12. 16X: Due to an equipment shortage, the 6:51am & 8:09am trips from Culmore to Federal Triangle will not operate April 10-12. 22B: Due to an equipment shortage, the 7:40am & 8:20am trips to Columbia Pk will not operate April 10-12. 22B: Due to an equipment shortage, the 7:15am & 7:55am trips to Ballston will not operate April 10-12. 22F: Due to an equipment shortage, the 6:15am trip to Pentagon will not operate April 10-12. 8Z: Due to an equipment shortage, the 6:55am trip to Pentagon will not operate April 10-12. 7W: Due to an equipment shortage, the 6:40am & 7:34am trips to Pentagon will not operate April 10-12. 29G: Due to an equipment shortage, the 5:45am, 7:00am, 8:15am trips to Pentagon will not operate April 10-12.